Many businesses, including gas stations along Interstate 29, are feeling the pinch as the highway remains closed in northwest Missouri after catastrophic flooding last month. MOUND CITY, Mo. 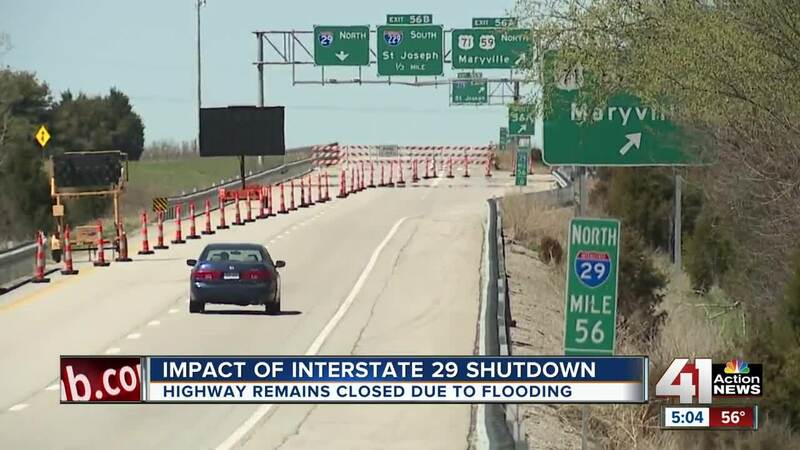 — Interstate 29 is closed from just north of St. Joseph, MIssouri, up to Omaha, Nebraska, after last month's catastrophic floods. The Missouri Department of Transportation has announced that section of I-29 may remain closed through June. Businesses in the area of the interstate are being impacted significantly by the closure. The Finish Line gas station near Savannah, Missouri, has become a hot spot for travelers. The convenience store is located along one of the detour routes, which has helped business nearly double since authorities shut down I-29 after water swamped the road. Molly Hamann and her family were returning to the Kansas City area from Omaha said the detours definitely come with some drawbacks. “There weren’t as many bathrooms, so for me that was kind of a headache but that was fine," she said. The detours has have added to Courtney Martin's driving time as she headed to South Dakota. “What would have normally taken us like four-and-a-half hours took us about six, so lots of back roads," Martin said. While some business are experiencing a boom, many businesses right off I-29 that rely on interstate traffic, like the Sinclair Kwik Zone in Mound City, Missouri, are feeling the pinch. “Our business has dropped over 50%, and it’s going to get worse as the summer goes on,” cashier Emilie Hart said. It's supposed to be the Kwik Zone's busy season, she said. “Usually we’re starting to see everybody traveling for Easter, getting those early summer vacations, spring break, etc., and it’s taken a hard hit,” Hart said. The convenience store has been forced to reduce hours and rearrange staff to accommodate the changing business pattern. With more snow up north, there’s concern the closure could last past June, too. “It’s a very strong concern for everybody affected,” Hart said.